Cris is a Registered Nurse in the state of Ohio, a graduate of LCCC and a graduate of West Virginia Canine College where she completed a 600 hour certification program on canine training and behavior, personal protection, Schutzhund, scent detection, police K-9 training, man trailing, canine health and kennel management. She was also a veterinary assistant and manager at Douds Veterinary Hospital. Cris continues her canine education by attending training seminars sponsored by Cornell University as well as leading animal behaviorists and trainers all over the country. Her experience includes more than 20 years of professional training in Lorain and Cuyahoga Counties and receives referrals from local veterinarians. Cris specializes in severe canine behavior problems and uses motivational training methods together with other proven training techniques to achieve the utmost results. Cris has experience as a 4-H judge and is an AKC Canine Good Citizen evaluator. 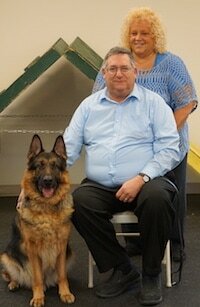 She participates in most areas of dog training including AKC competition and Schutzhund. She trains, breeds and shows German Shepherds. Cris established Club K-9 Training Center in 2000 at Douds Veterinary Hospital to help educate dog owners on the value of training. Susie has been training here at Club K-9 Training Center since 2003. She teaches puppy kindergarten classes, basic obedience classes and our tricks class. She has experience with teaching the intermediate, advanced, focus and Rally obedience classes and helps out when needed in these areas as well. She also has experience with her own therapy dog and knows how rewarding it is to own a well trained obedience dog. She is an evaluator for the American Kennel Club which allows her to test puppies and dogs for the STAR puppy test, CGC (Canine Good Citizen), CGCA and CGCR tests. She has attended seminars and classes at Ohio State and continues to attend seminars and classes to continue learning about dogs and techniques for training them. Susie is a 4H advisor for Clover Buds which are the 5-8 year old kids. She enjoys working with them and their dogs. She has also had the opportunity to be a judge at some of their dog events for the past several years which includes judging at the Lorain County Fair. Susie says she sometimes feels she has the best job in the world. She has the opportunity to see the progress from working with a puppy as it develops into a great dog, or seeing a shy dog that needs socialized blossom into an acceptable member of society. She says her job is very rewarding and not everyone has the opportunity to do what they love and enjoy doing. Susie lives at home with her husband Jeff, also an instructor here, and their German Shepherd Levi as well as their farm animals. Jeff Sandrock is our Rally Instructor here at Club K-9. He has attended seminars at Ohio State to keep up with the judging rules and new signs for 4H Rally judging. He loves working with those interested in Rally and especially our young 4H kids. He finds it is very rewarding as they grow and develop their skills in the sport. Many of our students have gone on to show their dogs in Rally obedience AKC shows and received titles on their dogs. He is an AKC evaluator for testing dogs, a judge for 4H at Lorain County Fair and 4H events and has been involved with Club K-9 since 2003. Andrea started her dog training career thru 4-H. She has been a 4-H advisor and dog trainer for the past 15 years. She obtained her 4-H Pet Pal Master and completed an accredited class on “How to be a Great Dog Trainer through Animal Behavior Associates” (2005). In 2009 she became a pet first aid instructor through the American Red Cross. She is always learning new ways to create fun and exciting informational classes. She specializes in educating children about the responsibilities of dog care and positive rewards of training. She is also currently working with local vet clinics and groomers creating knowledge for pet dog owners. Just as puppies learn so much in the first five months of their lives, she believes teaching starts with children. Andrea also visits the Wellington schools with her therapy dog Abbey a golden retriever owned by Kim and Scott Spreng, clients of Club K-9. Abbey has been in 2 live plays "Of Mice and Men" & "The Miracle Worker" at the French Creek Theater in Lorain County in which Andrea was a co handler. For the last 5 years Andrea has been working and training sign language with her special dog named Marlee, a toy Austrailian Shepherd. Marlee was born with the MDR1 gene and deaf. She almost died when spayed and was extremely fearful at a young age. It took her years to come out of her safe place and be touched by humans. Although Marlee is selective, she is now able to go out in public, visit the vet with minimal resistance and enjoy life, she even participates in agility classes every now and then. Marlee and Andrea have a bond of trust and communication that is out of this world. Andrea currently teaches Intermediate/CGC classes at the center and loves to do special events to educate the public on the importance of pet dog training. ​Darrell has been showing and training dogs since 1963. He is a professional handler and has a long history of showing dogs in some of the biggest most prestigious dog shows in the country like the well- known Westminster Kennel Club show in New York (as you can see by his pictures on the conformation page). He has shown many dogs to their championship levels and several he hand-picked from a young pup that he felt had the potential to become a champion. He was a long time handler and breeder of Boxers. Darrell also works with kids and their 4H dog projects in conformation and obedience. He is a 4H judge in Lorain County and the local Lorain County Fair. Darrell teaches conformation classes privately and in a run-thru class on Wednesday’s at the training center. For further conformation questions you can contact Darrell at (440) 666-7513. ​Laurie is our new Tricks/Conditioning Instructor. She is a retired school teacher who began training here at Club K-9 Training Center back in 2015. Laurie and her dog Putter have earned the CGC, CGCA and many Trick dog titles. She and Putter are a certified Therapy Dog/Handler team with over 150 visits to date. 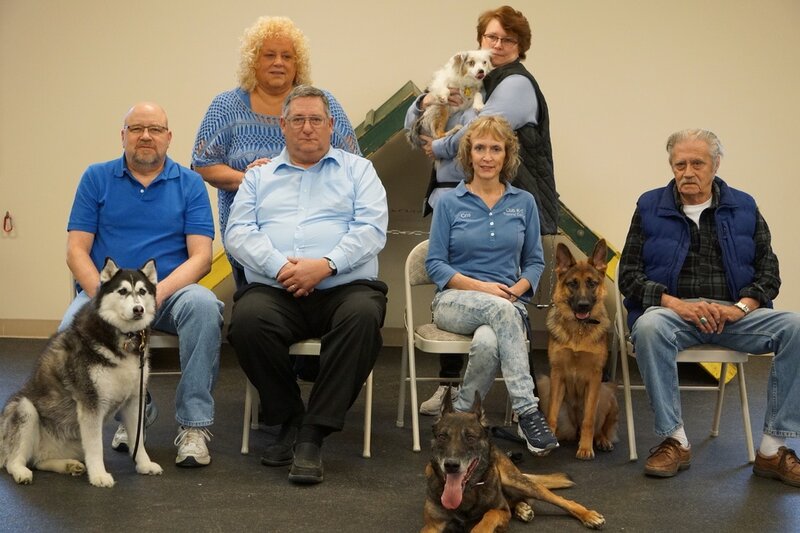 They continued their education by studying freestyle dance with Jenn Michalis and then went on to study with Kyra Sundance where Laurie became a certified trick dog instructor, stunt dog judge, and conditioning coach. They enjoy performing for local groups as well as teaching and learning new tricks.